Biju Veticad came back in May to help others. Faced with the natural disaster caused by monsoon rains, he went to work with the Diocese of Changanacherry to bring relief. Two Hindu families and one Muslim family found shelter in his home. 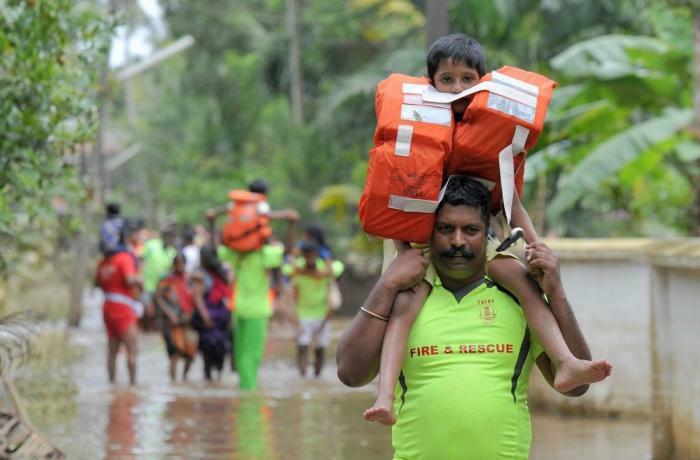 Changanacherry (AsiaNews) – The death toll caused by the Kerala floods has reached 410 and more than a million people have been forced into refugee camps. Monsoon rains stooped two days ago but the impact has been devastating with roads, houses and crops wiped out. The Indian state is on its knees. Critics have begun criticising the government of Indian Prime Minister Narendra Modi. Experts are saying that the flood was preventable and that the authorities underestimated the effects of climate change. The Indian government has thus come under close scrutiny, especially after it refused foreign aid, most notably INR 7 billion (US$ 100 million) from the United Arab Emirates. So far, it has allocated INR 5 billion rupees (US$ 70 million), whilst the initial estimate of losses is 86.13 billion rupees (US$ 1.2 billion). In Kerala, those who could left everything before the last wave of landslides and flooding. Those who remained, like Biju Veticad, a former seminarist of the Pontifical Institute for Foreign Missions (PIME), have rolled up their sleeves and gone to work with the diocese and state authorities. Here is his story. In Kerala we had a great calamity: floods and landslides. In early August, the monsoons caused great havoc in certain parts of Kerala. Some people had already left their homes in Alappuzha District. Everything seemed to be back to normal until more rain came in mid-August, which forced the authorities to release water from 27 dams in the state (in all 80 dams), causing floods in a number of cities, from the north to the south of Kerala. This lasted for days. In several places, water rose to the second floor of buildings and people had to climb onto roofs and terraces. In various parts of the state, landslides swept away houses, including the hometown of Fr Sabu. Rescuers have to use boats to move around in the cities. It rained for two days. Displaced people are still in shelters. In the parishes of our diocese (Changanacherry), we have welcomed more than 40,000 people from Kuttanadu (Alappuzha district-Back Waters area). I got in touch directly with the City of Changanacherry. I have been busy in shelters and I visited some abandoned suburbs. I came back to Kerala in May to help. Three displaced families, two Hindu and one Muslim, found shelter at my home. We have never had such an experience. Despite the suffering, this is a wonderful experience of harmony and love. People do not talk about religion or politics. Everyone is busy doing what they can. Our parishes and the diocese have already started the process of recovery in the Alappuzha area. As a low-lying area, Kuttanadu-Alappuzha gets all the water. Father Sabu told me that his family is fine. PIME has several confreres and many sisters in Kerala. Since I went through this in person, I thought I would share it with you and ask for your prayers. May the Lord give us the strength to get everything back together. I heard about the collapse of the Morandi Bridge [in Genoa]. I keep Italy in my prayer.